The Wario universe (ワリオ, Wario) refers to the Smash Bros. series' collection of characters, stages, and properties concerning the subfranchise of the world-famous Mario game franchise centered on series anti-hero Wario. Wario's franchise is split into two major subseries, the Wario Land series and the WarioWare series. Wario Land is a series of platformer games with cartoon mayhem, bizarre humor and somewhat unsettling imagery, a more deranged take on the normally cheery and child-friendly Mario archetype; WarioWare is a series consisting of collections of many fast-paced and quirky "microgames", minigames ranging from 4 to 8 seconds in length played in rapid succession, with many paying homage to Nintendo's other franchises and lesser-known titles. 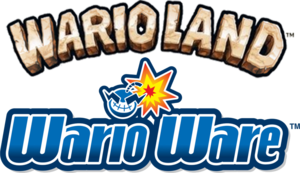 While its appearances in earlier Super Smash Bros. titles mostly adhered to the WarioWare series, later titles acknowledge and represent both the Wario Land and WarioWare franchises. 6.6 WarioWare, Inc.: Mega Microgame$! 6.12 Wario Land: Shake it! In mid-1989, early in the Mario franchise's release history, Nintendo released the Game Boy platformer Super Mario Land, in which Mario traveled to a far-off land to rescue Princess Daisy. This gave way to a subseries of handheld platformers; the second game in the series, Super Mario Land 2: 6 Golden Coins, which was released for the Game Boy in late 1992, debuted a new antagonist that resembled a larger, portlier, more thuggish counterpart to Mario, Wario, who was inspired from Popeye's Bluto. Wario, originally presented in a more straightforward, villainous light, takes over Mario's castle while Mario is away, then when Mario returns he must go on a quest to collect the six titular coins that are the keys to his castle in order to defeat Wario and reclaim it from him. Wario, for a time, then became a recurring Mario villain. Mario & Wario (a Japan-only release for Super Famicom in 1993) and Wario's Woods (released in the West in December 1995) both featured Wario enacting revenge plots against Mario and his friends. In one of Nintendo's first crossovers with a third-party franchise, Wario Blast: Featuring Bomberman, a Game Boy installment of the Hudson Soft franchise Bomberman, the Bomberman must prevent Wario from plundering his home planet. Wario was then permanently assigned a new role and outlook in the Mario universe, which is the one that still defines him to this day--that of a less-malicious anti-hero motivated by a comically insatiable greed. Like Yoshi and his own relevance in the Mario games, Wario forever became part of the collection of recurring Mario side characters that would take part in a variety of Mario games, such as being a selectable racer in Mario Kart, a selectable "board piece" in Mario Party and a major playable character in other Mario spin-off titles, while at the same time beginning to star in his own games. The "third" game in the Super Mario Land subseries, Wario Land: Super Mario Land 3, became the first game in the Wario Land series of platforming titles for various platforms, a series which established a style of platforming different from the familiar Mario formula of jumping and bouncing on enemies and focusing more on physical attacks such as running tackles. The scenarios in Wario platforming games typically center around Wario's greed-motivated adventures and the incidental deeds of goodness he commits for others while doing so, such as defeating a more threatening villain in his quest to claim the reward money. Early in his own games, Wario briefly had an equally greedy rival of his own, a female pirate named Captain Syrup, who had only recently made a return appearance in 2008's Wario Land: Shake It! (the most recent Wario-centric platformer) after a decade of absence. The Wario Land series had also spawned sequels. Starting from 2003, Wario additionally and regularly starred in a more deranged, parodic, borderline scatological series of party games entitled WarioWare, with an all-new cast of bizarre side characters and a very different twist on the established party game formula. In these games, Wario gets the idea to strike it rich by founding his own video game company and getting all of his friends from his home city, Diamond City, to program hundreds of extremely simple games for him. The gameplay itself resembles an extended, rapid barrage of extremely simple "games", each lasting mere seconds and taking no more than one or several appropriately timed button presses to complete ("microgames"), and the number of microgames a player can complete before failing a set number of times is set as their high score. The microgames display a variety of surreal imagery, including Wario having to jump at the right time in order to avoid getting run over by a giant hot dog on wheels, reenactments of classic scenes from old Nintendo games, and successfully guiding a finger into a nostril. Different installments of the series for different platforms have featured their own, unique twists to the gameplay dependent on the hardware of the console itself. Wario first became playable in 2008's Super Smash Bros. Brawl. In the Super Smash Bros. series, the WarioWare sub-series is recognized as Wario's "home franchise", separately categorized from the Mario series in a similar fashion to Yoshi and Donkey Kong. Wario was not recognized as a distinctive universe in Super Smash Bros. Melee, as there were no playable characters nor stages based on the franchise. However, there were trophies for Wario and the Bucket. In addition, one of Mario's alternate costumes in both Super Smash Bros. and Super Smash Bros. Melee is a yellow and purple color scheme based on Wario's attire. Wario is recognized and treated as a distinctive universe in Super Smash Bros. Brawl. It focuses heavily on the WarioWare games due to their extreme popularity. Wario: The franchise's first playable character. By default, Wario is dressed in his biker jacket as he is seen in the WarioWare series, but he also has his original plumber overalls as alternate costumes, giving him twelve different costumes in total. Wario has the move Wario Waft, which allows his to release gas he has built up over the match as a form of atomic flatulence. On the final character select screen (after all characters are unlocked), Wario shares a column with fellow Mario side series characters Donkey Kong, Diddy Kong, and Yoshi. Kat & Ana: These twin ninja kindergarteners use their ninja skills and slash in multiple "X" formations on the stage, damaging any foes that make contact with their attack. This is the only Assist Trophy originating from one of the Mario subseries. WarioWare, Inc.: Occasionally, the stage takes the player from the main "elevator" into a microgame, which they can complete to obtain a reward. Some microgames can damage or knock back characters. See List of SSBB Music (WarioWare, Inc. series). WarioWare, Inc. - A slight alteration of the main menu theme from WarioWare, Inc.: Mega MicroGame$!, as well as the title screen from the same game. It is the theme of the WarioWare, Inc. stage. WarioWare, Inc. Medley - A medley of a large number of songs heard in the first title of the series, WarioWare, Inc.: Mega MicroGame$!, including the opening theme, Wario's theme, as well as Dribble & Spitz's theme among others. It is used on the WarioWare, Inc. stage. This song is also played during Wario's Classic Mode credits. Ashley's Theme - A big band version of the vocal theme song of Ashley in WarioWare: Touched! It is used on the WarioWare, Inc. stage. Ashley's Theme (JP) - The same as the above song, but with Japanese lyrics. It is used on the WarioWare, Inc. stage. Mike's Song - A 50's rock-and-roll version of the vocal theme song of Mike in WarioWare: Touched! It is used on the WarioWare, Inc. stage. Mike's Song (JP) - The same as the above song, but with Japanese lyrics. It is used on the WarioWare, Inc. stage. Mona Pizza's Song - A fully redone version of the vocal theme song of Mona in WarioWare: Twisted! It is used on the WarioWare, Inc. stage. Mona Pizza's Song (JP) - The same as the above song, but with Japanese lyrics. It is used on the WarioWare, Inc. stage. Wario's victory theme - Shares similarities to many Wario games, featuring musical qualities from both the WarioWare series and the Wario platforming series. It would be implemented into the first stage music for the game Wario Land: Shake It!. snd_bgm_M14_WARIOSTAGE - This track was originally going to appear in Brawl, but it was scrapped. It is obvious that it is a track from the Wario universe, but it is unknown what the song is. It was most likely going to play on WarioWare, Inc.
Allusions were made to the Wario series prior to the release of Super Smash Bros. 4, but it was not revealed that Wario himself would return until after the release of Super Smash Bros. for Nintendo 3DS as he is now an unlockable character. As in Super Smash Bros. Brawl, the majority of the Wario content in Smash 4 comes from the WarioWare titles. A significant amount of focus was put on the popular WarioWare character Ashley, who appears as an Assist Trophy. While most of the character-specific music pieces from Brawl did not return, both versions of "Ashley's Song" return along with a brand new arrangement. A costume set based on Ashley was released as downloadable content for Mii Swordfighters. Otherwise, Smash 4 features content from Wario Land: Shake It! and Game & Wario, which were released between Brawl and Smash 4. Wario: a crude, pompous treasure-hunter from Diamond City and one of Mario's oldest rivals. Unlike in Brawl, where he was a starter, Wario must be unlocked. Wario is slightly larger and has more fluid animations. The swelling of his head and hands in some of his attacks has been compared to his attacks from Wario World. He now has eight alternate costumes as opposed to twelve in Brawl. Ashley Outfit (DLC): this outfit is based on Ashley, a young witch from WarioWare: Touched! who otherwise appears in Smash 4 as an Assist Trophy. The outfit was released with a corresponding black wig as downloadable content on February 3, 2016. The Mii wields Ashley's shape-shifting companion Red transformed into a scepter as a weapon. An official Mii based on Ashley's likeness can be downloaded via QR code on the official site. Bold italics denotes an Assist Trophy new to the Smash Bros. series. The Pic of the Day introducing Ashley as a new Assist Trophy. She was revealed prior to any knowledge that Wario was returning. Assist Trophies from the Wario series. In addition to those listed, Wario's partner in crime from the Mario series Waluigi returns from Brawl. Kat & Ana: a pair of kindergartners who practice ninjutsu. Like the Pokémon Latias & Latios, Kat and Ana fly across the the screen and slice opponents with their katanas. They cannot be harmed by opponents and they do not harm the summoner. Ashley: a young witch from WarioWare: Touched! When summoned, she conjures a purple cloud that causes a variety of effects, similar to Togepi. All opponents caught in the cloud are slowed, but she may also turn fighters invisible, or make food items damage fighters instead of heal them. Her design derives from Game & Wario. In the Wii U version, Ashley's hair turns white and her irises turn red when she conjures the cloud. These are details carried over from the WarioWare games. Kat & Ana (Red): a pair of kindergartners from WarioWare, Inc.: Mega MicroGame$! All collisions with walls and ceilings are automatically teched. Ashley (Blue): a young witch from WarioWare: Touched! She slows down the spinner on the board when used. WarioWare, Inc. (unlockable): staged in the elevator shaft of Variety Tower from WarioWare, Inc.: Mega MicroGame$! It is a transitionary stage where the elevator brings the fighters to one of nine microgames, seven of which are from Mega MicroGame$! : Arrow Space, Blowin' Up, Crazy Cars, Kitty Cover, Lose Your Marble, and Sole Man. The other two are unique to Smash Bros.: Don't Move - which requires players remain still - and Taunt - which requires players to taunt the self-obsessed Jimmy T. Successfully completing a microgame usually awards the player with a status effect that could benefit them in battle. WarioWare, Inc. is one of the possible stages to appear in Level 4 of All-Star Mode as a home stage for Wario. Its Ω form is columnar. Gamer (starter): staged in 9-Volt's bedroom from Game & Wario. The main platform is 9-Volt's desk, where his mother 5-Volt acts as a stage hazard. When 5-Volt looks at the fighters, a beam of light is sent to them and damages them for 20% with high knockback. Fighters can avoid this by hiding behind objects. She can appear from the doorway, window, TV, or, if the stage is set a certain way she will appear from a gaming pad or picture from an easel. Fake-outs can also appear. The layout of the stage changes each time the stage is played. It is one of the possible stages to appear in Level 4 of All-Star Mode as a home stage for Wario. Only its Ω form can accommodate 8-Player Smash, which takes place on the desk but without any of the books or writing utensils. Ashley's Song Ver. 2 an operatic arrangement of "Ashley's Song" from WarioWare: Touched! It plays on the Gamer stage. It is exclusive to Japanese releases of Super Smash Bros. for Wii U, but it is used in international trailers to promote the downloadable Ashley set for Mii Fighters. Arrangements and remixes from previous Smash Bros. titles. WarioWare, Inc.: a disco-influenced arrangement of "Title" from WarioWare, Inc.: Mega MicroGame$! It plays on WarioWare, Inc. and Gamer. WarioWare, Inc. Medley: a medley of pieces from Mega MicroGame$!, including "9-Volt (Intro)", "Jimmy T. (Boss)", "Dribble and Spitz (Intro)", "Dr. Crygor (Intro)", "Wario (Intro 2)", and "Title". It plays on Gamer. Ashley's Song (JP): an arrangement of "Ashley's Song" from WarioWare: Touched! It plays on the WarioWare, Inc. stage in Japanese releases and Gamer. Ashley's Song: an arrangement of "Ashley's Song" from WarioWare: Touched! It plays on the WarioWare, Inc. stage in English releases and Gamer. Compositions and arrangements directly sourced from Wario games with no alterations. Ruins: from Wario Land: Shake It! It plays on Gamer. It is the only piece of content in Smash 4 explicitly from the Wario Land series. Gamer: from Game & Wario. It plays on Gamer. Victory! Wario: an arrangement of the first few bars of "Ruins" from Wario Land: Shake It! It is sourced from Brawl, which was in development at the same time as Shake It! Only one Trophy Box appears in the Wii U version. It is titled "WarioWare, Inc."
The Wario series returns for Ultimate, featuring WarioWare representation yet again. However, there has been a significant increase in Wario Land representation from previous Smash titles, mainly through Wario's moveset and the addition of Spirits. Ignoring spirits, the Wario series itself overall received the same level of representation as its Smash 4 appearance, although Kat & Ana no longer appear as an Assist Trophy. Wario: Wario returns as an unlockable fighter. A few of his moves, such as dash attack, have been updated to better reflect his appearance in the Wario Land games, and Wario-Man is no longer a transformation and player-controlled, instead unleashing a flurry of cartoon-like attacks if it connects. Ashley: Ashley returns from Smash 4 with a slightly updated design from her appearance in WarioWare Gold. Both Wario stages from previous games return as retro stages in Ultimate. WarioWare, Inc.: Returning as a retro stage. Gamer: Returning as a retro stage. There are no new tracks and remixes for Wario, although all previous tracks return. Arrangements and remixes from previous Smash games. The track "Ashley's Song (JP) (for 3DS / Wii U)" was previously Japanese-exclusive. "WarioWare, Inc.": A remix of the main menu and title themes from WarioWare, Inc.: Mega Microgame$. Returns from Brawl. "WarioWare, Inc. Medley": A medley of tracks from WarioWare, Inc.: Mega Microgame$, including the introduction theme to 9-Volt's microgames, the boss music of Jimmy T., the theme for Dribble's and Spitz's microgames, the introduction theme to Dr. Crygor's microgames, the introduction theme to Wario's second collection of microgames, the newsflash jingle, and the main menu theme. Returns from Brawl. "Ashley's Song (JP)": A remix of the Japanese version of Ashely's theme from WarioWare: Touched! Returns from Brawl. "Ashley's Song": A remix of the English version of Ashley's theme from WarioWare: Touched! Returns from Brawl. "Mike's Song (JP)": A remix of the Japanese version of Mike's theme from WarioWare: Touched! Returns from Brawl. "Mike's Song": A remix of the English version of Mike's theme from WarioWare: Touched! Returns from Brawl. "Mona Pizza's Song (JP)": A remix of the Japanese version of the Mona Pizza theme from WarioWare: Touched! Returns from Brawl. "Mona Pizza's Song": A remix of the English version of the Mona Pizza theme from WarioWare: Touched! Returns from Brawl. "Ashley's Song (JP) (for 3DS / Wii U)": A military-march styled cover of the Japanese version of Ashley's theme, from WarioWare: Touched! Returns from the Japanese version of Smash for Wii U. Tracks sourced directly from the Wario games. "Ruins - Wario Land: Shake It! ": The theme played in Stonecarving City, sourced from Wario Land: Shake It! "Gamer": The "Mom Appears!" cue, sourced from Game & Wario. On the Gamer stage, this cue plays when 5-Volt appears (or to fake players out). Only the cue plays when outside of the Gamer stage. "Victory! Wario": A remix of a section of the Stonecarving City theme from Wario Land: Shake It! The Ultimate version is sped up. ↑ This character or item debuted in a game from a different universe. Wario debuted in this game and is a playable character in Brawl, Smash 4 and Ultimate. His ground pound move originated in this game and was re-purposed as his down throw in Smash. Half of Wario's costumes show him dressed in his classic overalls outfit, which was first seen in this game. His original monochromatic color scheme from this game is used as one of his alternate costumes. Mario's yellow/purple alternate costume in all Super Smash Bros. games (with the exception of Super Smash Bros. Ultimate) is based on Wario's color scheme. Wario's forward smash is his signature Dash Attack, which originated from this game. This was removed in Smash 4, but was brought back for Ultimate as Wario's dash attack, maintaining its faithfulness as a travelling attack from its original appearance. The requisite battle references Captain Syrup's ship, the SS Teacup and her henchman Bobo. Wario's belly flop neutral air seems to be inspired by his crouch jump in this game. Tiny Wario appears as a sticker in Super Smash Bros. Brawl. Wario's current short-sleeved shirt, which was first seen in this game is part of his alternate costumes. Wario's up tilt appears to be based on his animation upon completing the game 100%. Wario's monochromatic sprite color is used as one of his alternate costumes. Her battle heavily references her transformations in this game. Half of Wario's costumes show him dressed in his WarioWare outfit, which was first seen in this game. Wario's neutral special, Chomp, is based on a single microgame called Hot Dog Hog. Kat & Ana, whose first appearances were in this game, appear as an Assist Trophy together in Brawl and Smash 4. The stage WarioWare Inc. is based off several "Microgames" as well as the pig elevator from this game. The Wario & Bike and Mona & Moped appear as stickers in Super Smash Bros. Brawl, while five other stickers are from the GameCube port. Wario's neutral jab, up smash (headbutt), forward throw, down throw (Ground Pound), and his ledge grabbing animation all come from this game. Wario's back throw comes from this game. Wario's custom move, Inhaling Chomp, is loosely based on Hyper Suction from this game as well. The Wario World Symbol appears as a sticker in Super Smash Bros. Brawl. Wario's Final Smash, Wario-Man, originated from this game. Wario's second jump has him twist in the air, striking a pose reminiscent of his artwork from this game as well. Ashley, a lonely teenage witch who first appears in WarioWare Touched!, is an Assist Trophy in Super Smash Bros. for Wii U and Ultimate and has a theme song from WarioWare: Touched! that was remade specifically for Brawl. Various character appear as stickers in Super Smash Bros. Brawl depicting their artwork for this game. Two of the microgames appear (slightly altered) in Wario's home stage, WarioWare, Inc. and Gamer. The bouncing Wario nose creatures from this game's title screen appear as stage hazards in PictoChat 2. Palutena's Guidance references Wario-Man's origin story from this game. The Wario-Man spirit in Ultimate uses the artwork from this game as well. All of the voice samples of Assist Trophy Kat & Ana and of Wario's responses in the WarioWare, Inc. stage are lifted directly from this game. Three stickers are from this game. Wario's forward smash in Brawl acts similarly to the main attack from this game, being a stationary shoulder tackle. Count Cannoli appears as a spirit in Ultimate. Wario's crawling animation and Ruins's theme are found in this game. The spirits of Captain Syrup and The Shake King in Ultimate borrow their artwork from this game. Gamer, a minigame in Game & Wario, appears as an stage in Super Smash Bros. for Wii U. Additionally, 5-volt reprises her role as in Game & Wario. Kat and Ana's designs in Super Smash Bros. 4 are based on their appearance in this game. The artwork of most major WarioWare characters are used in the Gamer stage as decoration, and in SSB4 their artwork hails from this game. In Ultimate, nearly all of the WarioWare series spirits borrow their artwork from this game. These pieces of art are also used on the Gamer stage as decoration in Ultimate, replacing the Game & Wario artwork from Smash 4. The Wario universe is the only Mario sub-series with playable characters to not have been introduced in the first Super Smash Bros. While Wario's victory theme clearly matches the beginning of the Stonecarving City theme from Wario Land: Shake It!, it is debatable as to which came first. Super Smash Bros. Brawl was released on January 31, 2008, while Shake It! was released on July 24, 2008, meaning that Shake It! was most likely still in development at the time of Brawl's release. It is probable that Wario's victory theme was pulled from Shake It! before its actual release. This page was last edited on April 18, 2019, at 04:40.